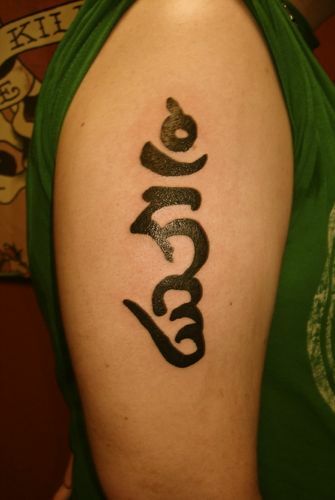 Beautiful Tattoo Pictures, Mantra Design and Symbols. Tibetan Tattoos are unique and colorful. There are a large variety of sacred mantra designs, names, auspicious symbols and even Buddha Tattoos available to make this body you inhabit even more gorgeous. 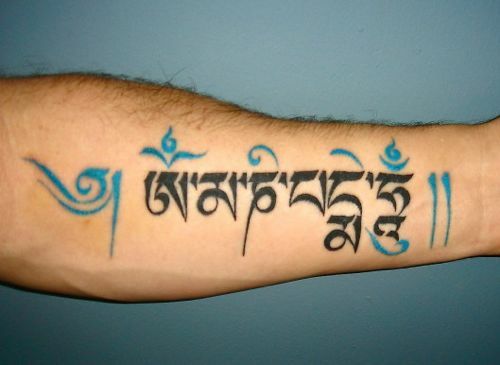 This Tibetan Mantra is ' Om mani padme hum ' or some say 'Om mani padme hung', is called the six syllable or Mani mantra. 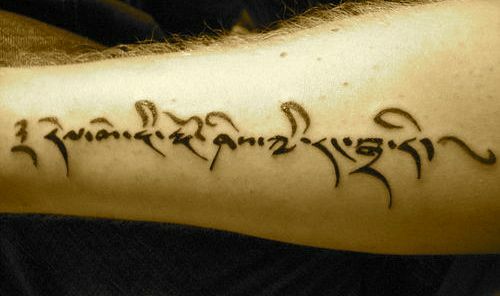 The Tibetan translation is 'Hail to the Jewel in the Lotus. This is the Mantra of Chenrezig, the deity of compassion in the Tibet language or Avalokateshvara in Sanskrit. 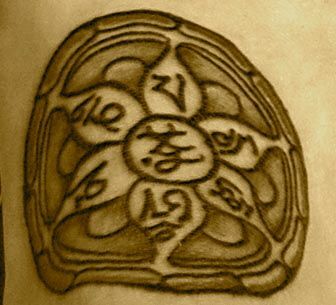 This Tibetan design is written in the U-med script. The Tibetan translation of this is 'without head' or written Tibetan words. Most of the pictures here are 'with head' or considered printing. 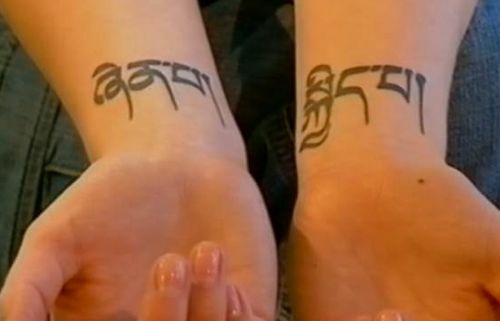 Tibetan words; two Buddhist terms written in U-chen. Sanskrit 'Hum' syllable in Tibetan U-chen script. In Tibetan Buddhist Art there are many forms of expression. From a Buddhist perspective the 'Dharma' or the Buddhist Teachings can be expressed in any language. 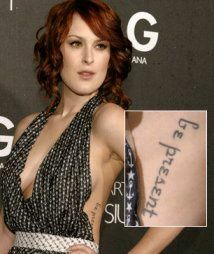 One of the basic beliefs of Buddhism is to try to 'be present' at all times as this woman's tattoo says. Although I do think that it's in a very awkward place for her to be reminded of this bit of wisdom on a daily basis! Would you like share it with other Tattoo lovers? Just click here to do it! a cool tee shirt? It's easy! Click here for more info.